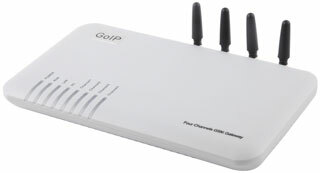 Our GoIPs come with all the common network, VoIP, and GSM features and they have been widely tested for compatibility, stability, and reliability. In addition, we’ve developed our proprietary Remote SIM technology for SIM card management without inserting SIM cards to GoIPs. Together with the SMS Server and SIM Sever, you can now build your own system for voice traffics between VoIP and GSM or a SMS Messaging system based on your application requirements. In addition, each GoIP is equipped with a Remote Control client which enables a secure remote access method for technical support and GoIP management. All of the above features are available at no additional charges. The concept diagram below shows a simple VoIP network for call center application. It consists of a softswitch/IP PBX and VoIP clients such as an IP phone, a call center operator, and GoIPs. All VoIP clients are configured to register to the softswitch/IP PBX. For the GoIPs, each GSM channel is inserted with a valid SIM card in order to access the GSM network. Both incoming and outgoing calls between the VoIP and GSM/PSTN networks can now be realized.